UPDATE: December 2016: Sadly, due to issues with Thailand’s air safety authority, Thai has not been given permission to deploy A350s on Australian flights. So I am on a 777 instead. Still looking forward to the flight. I am very excited to have booked a seat on Thai’s new Airbus A350-900 Royal Silk Business Class product from Bangkok, Thailand to Melbourne, Australia later this year! Thanks to the last Avianca deal which gave me a 125% bonus on purchased miles! I was able to use these miles to get a seat at a very good price with Thai Airways –for under one third of the usual cost! In fact I am paying not much more than Qantas was selling an Economy seat for! This will be my first A350, the newest member of the Airbus family. Like the 787, the plane features carbon fibre fuselage and wings. Airbus says that with its fuel-efficient Rolls-Royce Trent XWB engines, fuel burn and emissions are reduced by 25 per cent. Long-haul capability with a range of up to 8,100 nautical miles (equivalent to 16483 km). Airbus says the plane has enough fuel for a 19 hour journey. 605 have been ordered with 27 delivered. Originally Thai had 12 A350-900s on order, with the intention to purchase four and lease eight. Earlier this year, they announced they would defer all but two of the order. Then Thai reversed this in May, saying they were still committed to receiving two this year, five in 2017 and the rest in 2018. They are the eighth airline to receive the 350, following Qatar, Finnair, Vietnam, LATAM Singapore, Cathay Pacific and Ethiopian. TG’s A350s will seat 321 passengers with 32 in business class and 289 in economy class. 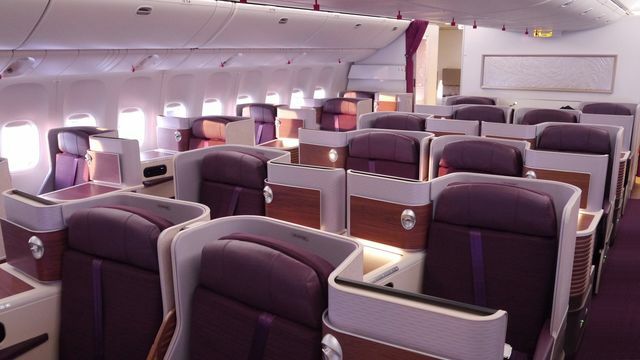 The Royal Silk business class seats are a lie-flat design with direct aisle access for each passenger. The cabin is intended to be “Thai Contemporary” style. I have yet to select a seat on the plane. No one has any idea which seat will be the best located in the cabin! My understanding is that Thai will offer ‘dine on demand’ meals and free in-flight Thai Skyconnect Internet to their business class passengers on the 350. Thai uses ingredients for Business Class meals from the Royal Project established by His Majesty the King in northern Thailand. Currently, Thai flies from Bangkok to Melbourne twice a day using 777s. From September both of their services will be flown using a 350. Airbus 300: first flown from Melbourne to Perth, Australia in 1991. Since then I have flown four A300s with Continental and one with American. A340- one of the planes I love though I have been on 16 A340s with eight airlines. As I plan my first A350 flight, here’s where they fly.